SPA FROG Floating System uses pre-filled mineral and bromine cartridges that snap into a reusable floating holder and work in any spa. SPA FROG® Floating System transforms your spa into the perfect environment for soothing relaxation using up to 50% less bromine. The SPA FROG In-line System is built right into the spa and uses the same mineral and bromine cartridges as the SPA FROG Floating System. For easy top loading of replacement cartridges, simply open the cap, pull up the holder and snap them in. 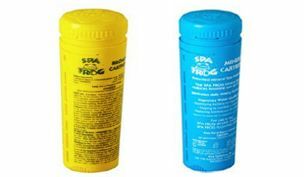 SPA FROG Mineral Spa Care offers a third approach to mineral spa care that fits right in your filter. Simply supplement the minerals with a low level of bromine or chlorine.